Summary: No one’s ever told Eleanor that life should be better than fine. My book club read ELEANOR OLIPHANT IS COMPLETELY FINE by Gail Honeyman for our March meeting. Everyone who came to the meeting actually read the book, and that's really saying something because that NEVER happens. Furthermore, everyone really liked and/or loved the novel. Those two things might be the biggest testament this book! ELEANOR OLIPHANT IS COMPLETELY FINE tells the story of Eleanor, a woman who doesn't really fit in with her surroundings. She is a loner who is extremely awkward, is judgmental and says what she thinks, and doesn't really care about what her coworkers say. She has a pretty structured life too -- she calls her mom one evening a week and spends her weekends eating frozen pizzas and drinking lots of vodka. It's a pretty sad existence. However, Eleanor's life takes a drastic turn when she meets Raymond, the IT guy from her office. They are drawn together when they end up saving an elderly man who fell on the sidewalk, and they continue seeing each other and building Eleanor's first real friendship. Raymond allows Eleanor to finally have a connection with someone; and although it's a rough road for her, she eventually learns that her life is worth more than she ever imagined. I really enjoyed ELEANOR OLIPHANT IS COMPLETELY FINE. It's a special story that's extremely funny and heartwarming, but it's also a serious book about mental illness and recovery. It's hard to believe that this is Ms. Honeyman's first novel because it is so well-written. She really managed to write an entertaining story with memorable characters. There are quite a few things to like about ELEANOR OLIPHANT IS COMPLETELY FINE. The book is extremely easy to read, and her characters are just fantastic. Both Eleanor and Raymond are extremely well-developed and so darn likable; and their encounters are something special. Everyone, but Eleanor especially, need a Raymond of sorts in their life. Raymond wasn't perfect, but he was an amazing friend. He cared about Eleanor despite her quirks (and that's a nice word for her issues), and he never gave up on helping her... even when it was difficult for him. Another aspect of this novel that I appreciated was how it handled mental illness. Eleanor was a deeply damaged woman who experience some horrible events from her childhood. It's amazing she was functioning at all given what she saw. She never got the help she needed and she was pretty much left to fend for herself when she needed a support system. It was such a tragic story and I thought the author gave an interesting (and pretty realistic) look into the distress Eleanor felt. Finally, I loved how this book made me feel. Of course, mental illness and depression are very serious issues, and the author handled them in such a unique way. Don't get me wrong, this book was sad and deeply disturbing at times; however, there was also so much humor in this story. In fact, it was laugh out loud funny at times, namely when Eleanor was providing her thoughts and insights into other people. I also enjoyed how this book showed the strength of individuals and the power of friendships. Eleanor's friendship with Ray ultimately saved her life. She began seeing herself differently, and she was eventually able to face the demons from her past. The ending of this novel was left a little bit open-ended depending on what you think happens to Eleanor and Ray, but I believe the overall intent of the author was to leave readers with a feeling of hope! Reese Witherspoon plans to produce the movie version of ELEANOR OLIPHANT IS COMPLETELY FINE, and I suspect the movie will be just as delightful as the novel. In the meantime, I do think this is a great selection for your book club. We actually spent quite a bit time talking about Eleanor which is also very unusual for my book club -- she's fascinating! I did find this reading guide which will help drive your discussion. 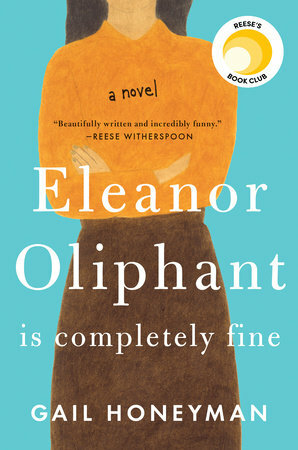 Eleanor Oliphant was a big hit with my book club, and I suspect you will fall for Eleanor too! Highly recommended. Thanks to Kathy (aka Bermudaonion) for sending me a copy of this novel. Wow, I'm impressed everyone read the book! I really liked this book even though someone ruined the ending for me as I was reading it. I’m curious about this book because award committees seem to love it. Hopefully I’ll get a chance to read it soon. Great review! I have seen this everywhere in the blogosphere. Maybe I will add this to my ridiculously large TBR pile. I always enjoy reading your thoughtful reviews. What really stands out for me is the fact that everyone in your book group read the book! That says a lot to me! Putting it on my TBR for sure.